Many types of camera equipment, including on this application which is equipment for camera phones. The application, come by Microsoft Developer and published for Windows phone. This application is excellence, can take moving pictures through the phone camera. Then the result is the number of rows, that you can selecting. The other great, if the order of the photographs in the swap from beginning to end, then it will happen... a movement like his thing a movie. 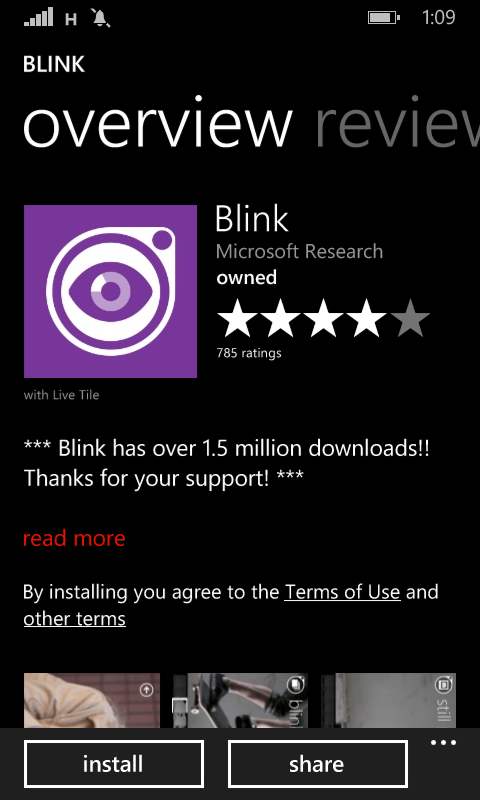 The Windows market already provides the application with the name is: "Blink". If it has been obtained, please install. Once installed, Than take any moving objects ... recommend during the day. That make a details of the image will be clearly visible. When it is in the get a result, you can instantly share your work into social networks, like: Facebook, tweeter, Google+ or publish as works of art via Blogger website. You are on the website page WINDOWS MOBILE PHONE - setting and Upgrade. Blink With the link URL http://hand-uk.blogspot.com/2015/02/blink.html for this articles, you can bookmark or share to any. Our expectation that Windows smart phone users, can understand and know about OS Windows phone. Blink Is a link for you, How to use the pure smart phone.